It was great to be back in VA/MD to visit with friends and family; however a blog post filled with “we visited friends and family, ate and laughed a lot, and caught up on gossip” is 1) boring and 2) really short, I decided instead to focus on some modifications we’ve made to R2 in the last couple of months. Since there is a lot of information in this post, I broke it into a few different sections: factory, small/easy fixes, after-market, and organization. 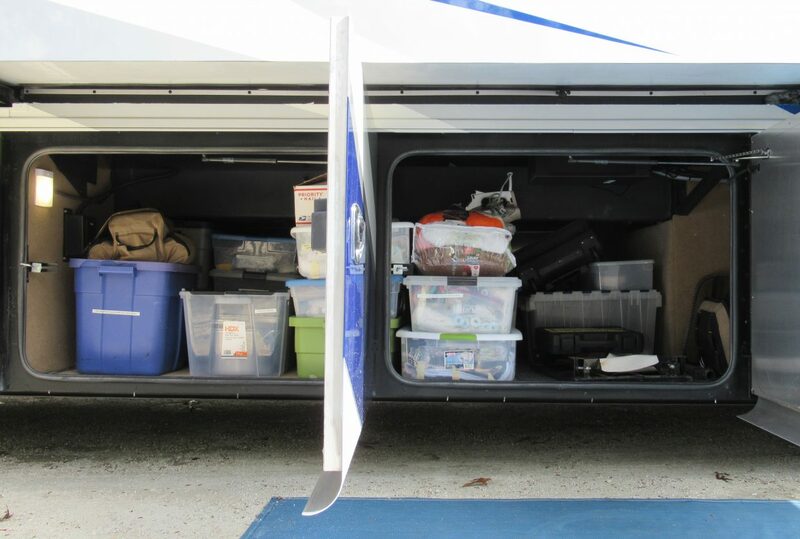 After living in Rover for three years, we were very happy with his storage and functionality. The nice thing about living full-time in an RV, you know what you like and what you don’t like. While watching Tiffin build R2, we noticed a few things we really wanted to have changed. Customer service is a top priority for Tiffin so they happily obliged making some modifications for us right at the factory. Our first major ask invovled the pop-up “power tower” in the dining area. The tower contains power and usb outlets and pops up in the middle of the countertop to allow easy access the ports. It’s a good idea in theory, unfortunately the implementation leaves much to be desired. When the tower is closed, you can’t use the outlets so you have to be willing to plug and unplug your equipment as needed (we leave our laptops connected 24/7). Worse, when closed it does not sit flush with the countertop, making that space (where my laptop usually sits) unusable. Before: power tower installed in dinette countertop. We asked Tiffin if they could just pull out the tower and cover the hole, figuring my laptop would hide the patch. They far exceeded our expectations and the patch they placed was virtually invisible! They also added two small holes & grommets to the sides of the countertops so we can permanently run our own cables down to the outlets and keep them out of the way. After: tower removed, hole patched, and new holes with grommets installed. Another 40IH customer a few days behind us on the line had asked to lower the clothes rod in the back closet as she found it difficult to reach. Since the reinforcements to hold the rod can’t be moved, Tiffin instead added a shelf where the rod was, and attached the rod under the shelf. It worked out so well that we asked for the same modification. While the plant manager playfully stated, “You customers have to stop talking to each other!”, they made the change for us and it sounds like they are considering making that modification to all new 40IH coaches. We find that upper shelf is perfect for keeping our shoes out of the way. 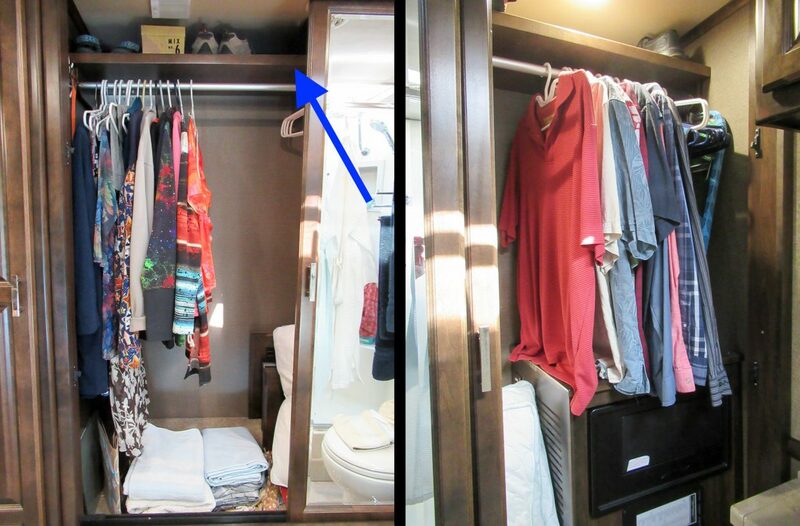 The lower rod means clothes in the back of the closet above the electrical cabinet have less space, but we bought some “Higher Hangers” which helps in that area. Shelf installed in rear closet. Last, our new wet bay is much smaller than our old one, and its cover extends almost all the way to the bottom of the bay, making it near impossible to get to the plumbing if there is a leak. I understand Tiffin does that to keep the wet bay looking neat but as we prefer it to be functional we asked them to cut off the bottom section of the metal cover. It’s now much easier to get to the pipes and connections, we can see our tanks to get a visual on our fresh water level, and it makes it much easier to install our See-Level tank sensors (see below). The guy who did the modification liked it so much he kept bringing his co-workers over to our rig to show them! After we moved into R2, I spent a fair bit of time grumbling about the weird storage spaces, towel rack/bar placements, and lack of time to organize the basement storage to my specifications (ya, I’m a little rigid about storage). Poor Mike had to listen to me mutter a lot until we had finally had time to make the changes. Our back bathroom has two sinks (yay!) and the bathroom cabinet extends across the entire sink area (yay again!). 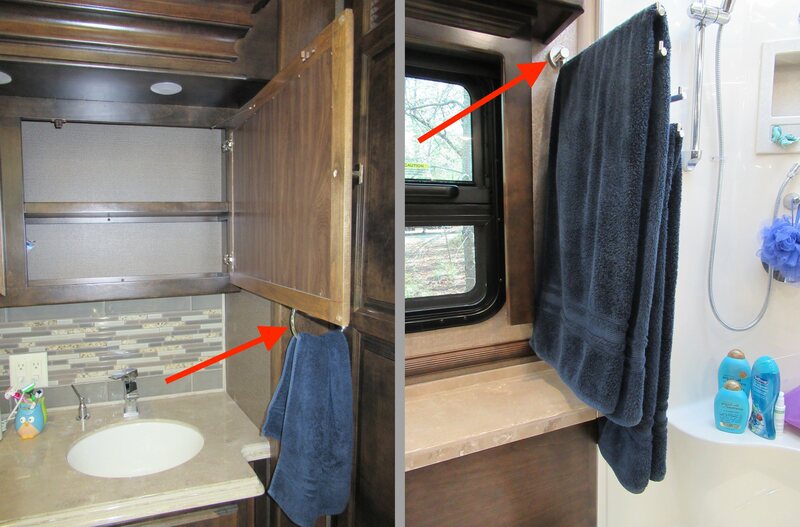 Unfortunately the placement of the towel holders meant the cabinet doors opened only halfway (to a 45º angle) and stopped at the most inconvenient spot (i.e. right where I would knock my head into them EVERY.TIME). We removed and repositioned the holders to allow full access to the cabinet. We also raised the towel rack by the shower so our towels would actually hang from the bars instead of resting on the back of the toilet. Lastly, we added a towel ring in the mid-bathroom and moved the toilet paper holder since you had to be a contortionist to reach it. Several towel holders moved to better locations. While the majority of the coach has ceramic tile floors, the front slides are covered by carpet (including the cabinet under the sink). I’m not a clean cook, I drop things everywhere. That means the little strip of carpet in front of the kitchen would get gross quick and since we put our trash can and dog food into the sink cabinet, that carpet would get gross too. I bought some plastic carpet runner, cut it down to size and covered those areas, so now I can mess to my heart’s content. We also have carpeting under our dining area. Opie loves to lay under the dining area and since we also use it as our main area when working, that carpet becomes matted and dirty fast. In Rover, even with regular shampooing, it looked terrible after a couple of years. I didn’t want to carry the shampooer around for that little spot, plus I hated the way the carpet wore down so quickly, so I added more plastic runner in that area. Now it’s easy to broom away the mess and I no longer need the shampooer. Some of the areas we’ve protected with plastic carpet runners. Tiffin adds rear and side cameras for increased visibility when driving and changing lanes. When using our turn signals, the screen switches to the side view, but we’ve found that the side cameras provide very little benefit over our side convex mirrors. More importantly, the rear view is far more helpful to check whether there’s clearance behind our tow car when merging or changing lanes. In Rover, Mike modified the wiring and added a switch so we could turn the side views off. In R2, the camera monitor is configurable and has a setting to allow us to disable the turn signal triggers without cutting into any wires! 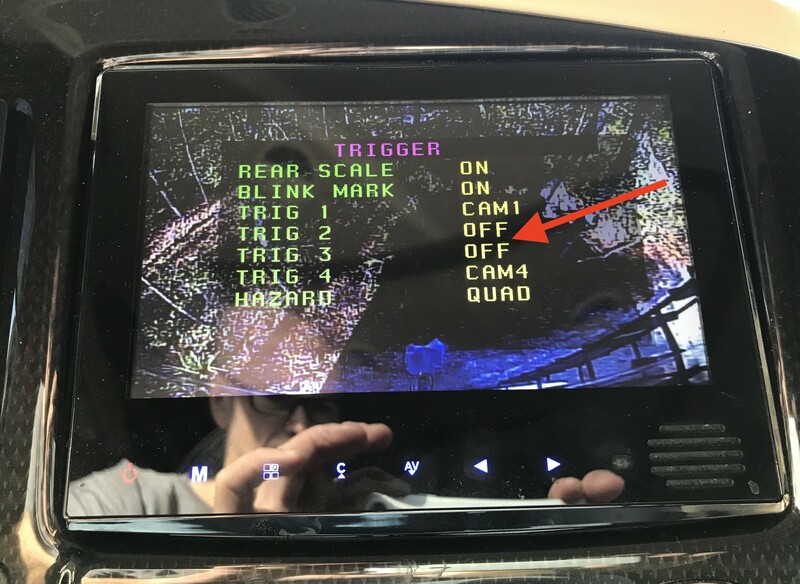 These triggers are connected to the turn signals, and normally enable the side camera views. Our first week in Rover we had Ultrabreeze vent covers installed by Camping World over two of our three Fantastic Fan vents. Now that we are more comfortable with working on our RV, we just bought the covers (on sale!) and installed them ourselves. It allows us to keep the vents open and fans running running even if it’s raining and it greatly reduces the chance of bugs being splattered by the spinning fan (a super-plus for me). Before and after: Fantastic Fan Vent covers installed. In the Open Road and Phaetons, the water, gray, and black tanks are monitored with three sensors so the tank readings are either 0, 33, 66, 100% which often makes it a (not so fun) guessing game when we’re close to the limit for our gray or black tank. Since we’re keeping R2 for a long time, I really really wanted the See-Level monitor. It allows much more granularity, reading in increments of 3% which means better visibility into the real level of each tank. The monitor is in the wet bay so we can see the levels when filling fresh, dumping, and flushing tanks. Inside the coach, our Spyder control panel shows the tank levels. Now I can see exactly how much one load of laundry takes and know our tank limits when we don’t have sewer connections (which is often). Left: a new See-Level sensor strip installed; Right: accurate readings on the Spyder panel. 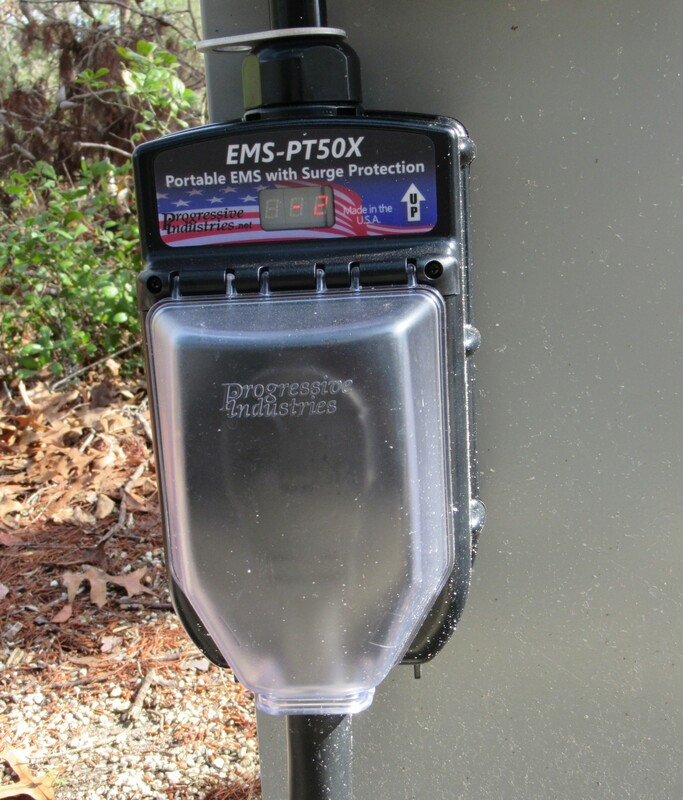 For Rover, we installed a hardwired Progressive surge protector but we heard that Progressive recently changed their policy so that hardwired units must be installed by a professional to qualify for their lifetime warranty. So instead, we opted to buy a portable Progressive protector that plugs into the campground pedestal. Our future plan will be to cut the power line inside of the coach, add outlets on the ends, and plug the portable unit in inside R2. That way we still have the warranty but don’t have to worry about portable unit growing legs and walking away. Portable Progressive EMS plugged in. Tiffin coaches come with one built-in water filter. In Rover we added a water softener as well as a second stage water filter. The first filter caught sediment, then the water passed through the water softener. The second filter was a finer carbon filter but only cold water passed through that filter (per Tiffin’s design). We wanted the same setup in our new coach but the wet bay is tiny in R2. There is no space for a second water filter or water softener. We’re holding off on the water softener for now, but we really wanted a second filter. The sediment filters are a lot cheaper than the carbon so we can change those out every 2 months and change the carbon every 6 months. Since we can’t install the second filter in any good spot, this one is just an ugly hack. We simply attached the filter to a hose outside of the coach. It does need to be removed, drained, and stored before every move but at least it does the job. It ain’t pretty but at least we have two-stage water filtering now. Lastly (and this is probably Mike’s favorite change), we bought CoachProxy for R2. This little box plugs into the RV’s network and lets us control our lights, thermostats, floor heat, fans, and monitor our tanks and batteries from our laptops and phones, from anywhere! If we’re out, we can monitor the interior temperature and turn on fans or AC/Heat to keep Opie comfortable. If the coach loses power, we can remotely start the generator as needed. CoachProxy also sends email notifications regarding tank levels and various other alerts. It’s pretty awesome and Mike will be posting more soon about the whole system regarding technical details, blah blah blah. R2 has some HUGE cabinets but we ended up with a lot of wasted (and very disorganized) space. While others have used pull outs and wire shelving to organize their space, we wanted the ability to adjust our shelving as needed. So I found metal shelving hardware online, bought some 3/4” plywood, and stain. Did lots of measuring, made Mike cut the plywood (saws and I do not get along well), stained, installed the hardware, and appeased my organization demon. I could finally take advantage of my mad Tetris skills to pack the cabinets full of stuff. Before and after: Double cabinet above the main sofa. When the shelves were finally installed and I was happy with the inside of R2, I focused my attention on the mess we called the basement. Since we moved into R2 rather quickly, there wasn’t time for any semblance of order. With some time, I finally removed everything out of the basement and organized it to my satisfaction. The basement has a lot of space, if you can use it efficiently. Yes, we are probably the only ones who did not get the sliding trays added to our storage bays. While the trays make it more convenient to get to items, I did not want them for two reasons. The chassis rail passes right down the middle of the coach from front to back which lowers the usable storage quite a bit in the center. Since the sliding tray pulls out completely on either the DS or PS, you cannot place any items higher than the chassis rail or the tray won’t be able to slide out (see photo below). Without the tray, we can stack cargo much higher along both sides of the coach since we can stack higher than the rail. The sliding trays also (obviously) can only be as wide as the compartment opening, so with trays we’d lose some useful storage space in between the two trays (and under the trays). Since I need to use every square inch for my crafts… *cough cough* I mean our stuff…, I felt the sliding trays weren’t the right answer for me. Plus if we ever decide we want the trays, we can always install them at another time. With all the changes we’ve made to R2, I’m really happy with how he’s been doing so far. With the organization complete, there is a lot more storage space than I originally realized, plus the spyder/coachproxy systems makes it easier for me to be lazy (eg don’t have to get off the couch to turn on lights or ac/heat). I have come to the realization that we were glamping in Rover. In R2, we’ve far surpassed glamping and gone straight to ludicrous….I love it. Great modifications, and I bet you are in love with the diesel power and how quiet it is compared to a gas engine. We really are! We’re glad we started with the gas since it gave us an easier learning curve but moving to diesel is quite an upgrade. The power and stability while driving is excellent! Great job! Those little details are so important. I wonder how many RV designs are user tested before finalizing? I know that having a gray cloud build over my head every single time I had to contort to find the TP would lose the RV company a lot of goodwill. True. I think the toilet paper was probably one of the first things to move! I know Bob Tiffin and his wife often try out new coaches but yeah, I don’t know how many are really user-tested. I do think Tiffin constantly makes modifications/improvements as they find a better way to build the coach, which means each coach is a bit different. Great post! Hope we can “borrow” your hack ideas when we finally get out! In our time in our Itasca, we have hated how dark the overhead storage cabinets are. Recently I found these lights in Amazon. The are rechargeable LEDs that stick up magnetically. They also have lotion sensors. They come n a two pack. I put on at each overhead cabinet door. When you open the door, the lights comes in, when you close the door, the light goes out after 20 secs. We have these and love them! Thanks for the tip! Some of these cabinets are so deep that a small light inside would be really helpful. I’ll have to check out those lights, I think they would be great. Hi Cathy. Love your blog and love your additions to R2 ! We are trading our RED 37PA for a new 40IH. It looks like R2 is White Mahogany with the Deep Garnet replaced with blue. Is that blue the Lapis Sky or the Pacific Blue? Do you have issues with reclining the passenger’s seat with the slides in? Have you found any work arounds for that? Thanks and have fun! We got the Pacific Blue. I believe Lapis Sky is the color scheme for the bus which has the Pacific Blue. When we were in Red Bay, we looked at the paint chips and there was Smoky Teal and Pacific Blue for the two blue (ish) options. Nice modifications. Everything looks fantastic! I wish we had done something to protect the carpets. We knew they would get grody with the dog and, what do you know? They got grody. I wish we could have just avoided carpet altogether. Oh well. Anyway, what are your plans re solar? Are you gonna get panels again or just rely on the generator when you’re dry camping? Yeah, the carpets get pretty bad. It’s not just Opie for us. The constant movement of the chairs and weight on the carpet just matted it quickly. We thought of replacing the carpet with tile, but that would have been crazy heavy so we just sold Rover instead. :) I’d say if you do plan to keep Barney, just replace the carpets after a couple years with a better quality one. So far, I like the plastic cover for our dining area, it ain’t pretty but it works. We will definitely get solar for R2. We have the pre-wire so at least we don’t have to run that this time. We will need a lot more panels to keep our electric hog working but it’s in the future plans (probably sooner rather than later). Hello, Kat! My husband’s nephew Aaron Moseman turned us on to your blog and we drop into your adventures every now and then. 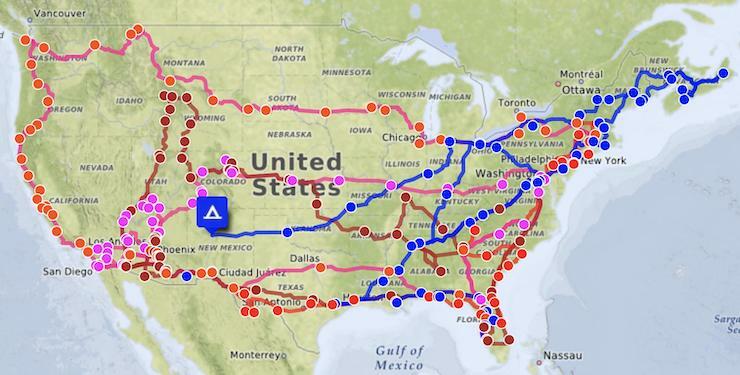 We have a 2007 40′ Phaeton and probably make 12-14 trips a year. We spent a month in Red Bay last week (haha – you know what I mean!) and since our coach is more than 10 yrs. old, could not avail ourselves of any Tiffin service. Our buddies in our Tiffin rally club gave us a list of local services, everything from carpentry to flooring, provided by ex-Tiffin workers and current Tiffin workers who moonlight. We were very pleased with their friendly courtesy, their work ethic, and the quality of their work; we’re happy to share it if you ever need it. We had Bay Diesel service and inspect, Benny’s Bunk House the same on the RV atop the chassis, Kimbrough’s south of Muscle Shoals added a Safe-T-Bar + and spiffed up our hubs, Chris Berry replaced our ugly fluorescent light fixtures with leds set in our wood & stain, and new carpeting at Nichols Customs. Our old coach is in tip-top condition and looks great. We now have a new wishlist that involves several of the storage items you mention for our next trip. Hi Alana! How cool, we haven’t seen Aaron in years but it’s nice to get the connection. Ohhh, yeah, Red Bay. We’ve used Bay Diesel for our gas service in the past and really like them. We’re thinking of a couple of modifications for our coach when we get back to Red Bay in April. We have a punch list of warranty items for Tiffin but then we’ll schedule some after-work stuff with a few of those guys. Did you make appointments with them in advance or wait till you got there? I know some of them get booked quick. Sounds like you take great care of your coach, lots of great upgrades there. Hopefully we can cross paths in the future. 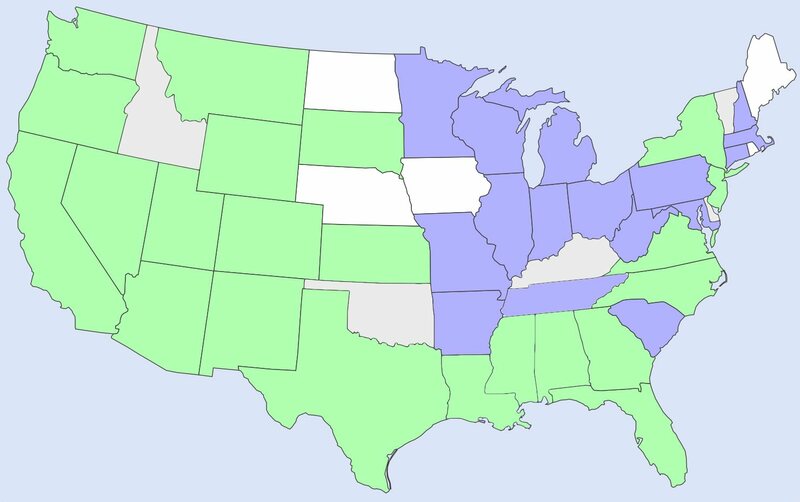 Are you located on the East Coast? We have a schedule on the sidebar of our blog. If we’re in the area, we’d love to meet up and trade notes! P.S. 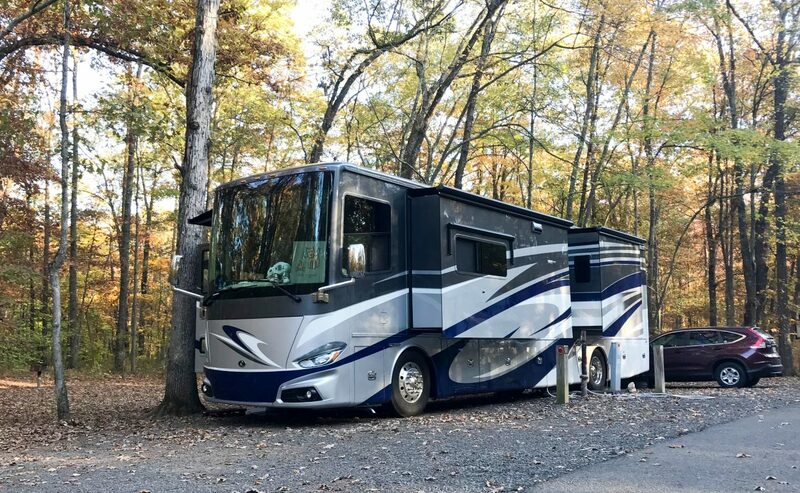 We bought our first RV (2005 35′ Phaeton) in 2011 and have been having a grand time since then! I had a moment of guilt (but only a moment) at your comment regarding having to move into R2’s basement space quickly ;) love that you have found the answer to the storage issues but still think you could have built an apartment in the basement for Opie … love all the additions/adjustments … and we are borrowing your carpet covering idea for Helen’s carpet, too !!! LOL! I could probably built an apt for ME in the basement but I’m ecstatic at how much basement space I have for my crafts! Plus with the bigger chassis, it can take more weight. Yeah, the plastic covering is a good idea, I wish we thought of it earlier with Rover. If you ever get the chance to get to Red Bay, there are some good after-hours folks that could probably replace those carpets with a better quality one. I love following your adventures!! I noticed that you didn’t go with the l-shaped sofa in your new unit but had it on Rover. Any reason why? Did you like having it on Rover? We’ve heard they are not comfortable and not used much. The l-shaped sofa came standard in Rover and we really liked it a lot. We liked it so much, we planned to get it for R2 also but then saw it in person. That space is much shorter than Rover’s sofa area and the L-sofa is smaller and didn’t provide as much increased sofa space as the L-sofa in Rover. We figured it wasn’t worth the upgrade cost and stuck with the standard sofa, which we hate. At some point we plan to change out our current sofa (short seat, straight back) for something else but it’s slightly lower on our list. I think the L-shape is definitely a matter of opinion. We liked ours because we could fit the three of us on it easily (or guests) and it stowed away nicely. The cushions started hard (but I think all flex-steel sofas do) and softened nicely after use but I know many still don’t like it. Ludicrous is good! Love the mods you have done. The modification to your counter top for the wiring is definitely an option Tiffin should offer. When we first went to the Service Center for warranty work on our 36UA I asked the tech if he could do that. They couldn’t find the covers needed to do it. I ended up buying some form Amazon and installed them myself in the same spot as yours, works great for getting that tangled web of wiring. With a hole saw drilling the hole was very easy. Thanks! When we had Rover, we drilled a hole/placed a grommet in the countertop for the same reason. I understand why they have the power tower but with two outlets on either side of the countertop, simple grommets would seem the easiest option, especially for power hogs like us that need more than a few outlets and usb ports. Having those grommets are really great, I agree with you, it would be nice for it to be an option. I am glad that Tiffin did the drilling for us since I have no idea if the countertop would crack (me being paranoid) if we did it. Plus having it done at the factory meant they could find the perfect plug to patch the original hole. A couple of other items to consider. We put slip loom tubing wire cover over our clothes rod in the closet. https://www.amazon.com/Outer-Polyethylene-Split-Tubing-Length/dp/B00R1J3546/ref=sr_1_2?ie=UTF8&qid=1517108340&sr=8-2&keywords=3%2F4%22+Outer+Dia+Polyethylene+Split+Loom+Tubing+Wire+Cover+2M+Length The hangers fit down in the groove and do not slide all over the rod bar when we travel. Hi Graig! Thanks for the links. We actually used to have the adjustable meter but we ended up breaking two of them due to unforeseen cold weather. Since we got tired of replacing them, we just went with a fixed regulator, but we did go with the higher psi of 50-60. With no moving parts, I can’t break this one (fingers crossed). Interesting idea with the split tubing wire! Never thought of that as a mod for holding the hangars in place. Thanks for the idea! 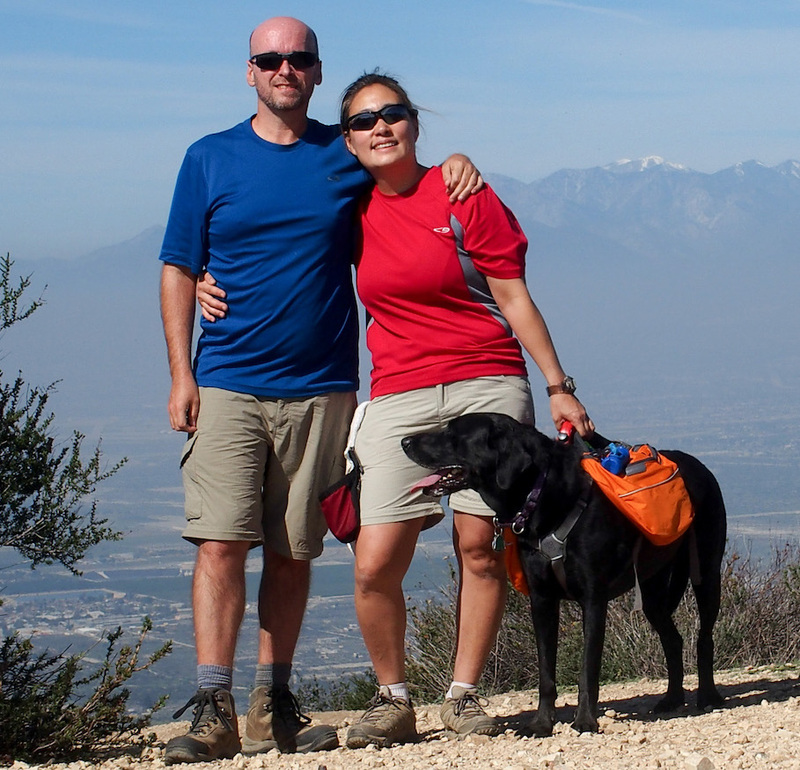 We are new to your blog which was recommended to us by Wheelin It when we read their post on mapping tools. Since then I have exchanged emails with Marc on the subject, but this is the first post we received since signing up. A couple of comments and/or questions. 1. With regard to the portable EMS plug-in, although we have a permanently mounted EMS inside the coach, a mobile service tech recommended we get a portable one for 2 reasons. First, it protects the electrical cord. Second, it ensures that all the circuits at the pedestal are good before it allows any electricity to flow downstream of the pedestal. We plug the coach cord into the portable EMS, then plug the portable EMS into the pedestal and turn on the circuit breaker. It takes about 2 minutes for the EMS to check the circuit. 2. As for the outside filter, at the risk of asking a really dumb question, why does it have to be drained before you move. 3. As for basement storage, since you have exposed chassis rails, an Entegra owner had a really great mod that hung shelves from the chassis rails. Let me know if you are interested and I will try to find and send it to you. We are really looking forward to following your blog and looking back over prior posts. Thanks for taking the time to share your experiences. Hi Bruce! I’m glad Mike was able to help with the mapping. It’s a great tool but not terribly user friendly. Huh, interesting that you have two EMS. We hadn’t thought about protecting the electric cord itself. Can’t the cords withstand the electric surges that could occur? I always figured the EMS is there to protect more of the electric equipment that would fry with the surge. Course it certainly can’t hurt to be extra cautious. The outside filter isn’t a dumb question actually. The filter has open ends so if I don’t drain out the water before storing it, our driving causes lots of sloshing and spilling into the storage bay. It’s just a way to keep our storage bay dry, there’s no other technical or physical reason for it otherwise. Oooh, I like the shelf idea under the chassis. If you have the link, I’d love to see it. I’ll have to google and try to find that. I always enjoy reading mods other people have done, especially if it’s something we could use. We haven’t had a chance to really get to know the mapping tool, but soon. We didn’t intentionally plan on 2. We had the first one installed when we took delivery of our coach back in Jan 2014. It wasn’t until the mobile service provider recommended having the EMS at the pedestal rather than inside the coach that we got the 2nd one. Pretty sure than when we take delivery of our new coach we will only use the pedestal EMS. Since extension cords can be damaged by a surge or some other malfunction like loss of a ground, it just makes sense to protect the whole system from the pedestal. Of course, the challenge is to make sure the pedestal EMS doesn’t go for a walk and forget how to get back home. As for the mod, I tried to copy the mod and pictures to this reply, but it didn’t work. I will send it separately. There was an original posting and then a couple of years later an update was posted. Hope it will work for you since it gives you the option of having a slide without loosing the dead space between the chassis rail and the door. Good luck. Did you get the separate email with the shelf mod? Yes, thanks! The pictures helped. Interestingly someone recently complained about the same issue (lost storage above the chassis rail) so I passed the pictures to them. :) Thanks! Great. I hope you and your reader find the description and pictures of some help. Who did the See-Level tank sensors? We did them ourselves. We bought the 709-RVC model and a kit from Spyder to make it work with the spyder system. There’s also a different model that will allow you to connect via bluetooth so you can see the levels on your phone. Hi Kat – can you recall if you guys used the standard 12″ 710ES senders for your SeeLevel install? Also, what was the kit you needed from Spyder? Kat, what color leather is your furniture? I really like you combo of mocha with the sofa’s. We like mocha, but cannot decide which color furniture to go for on a 36LA. As always, thanks for your feedback. Hi Bill, we got the brown sugar for our couches. The white is nice and would make a good contrast with the mocha but not for us as it would get dirty pretty darn quick. Congratulations on the upcoming retirement! You must be so excited! We’ll be back in the area in May. If you have time, we’d love to meet up and see what you have planned! One question now that you have been in it for a few months. If someone had offered a “free” upgrade to the 44OH instead, would you have taken them up on that offer, knowing what you know now? It will help us decide between the two. Would the additional size be an advantage or a limitation – probably some of both in my mind – but which would you prefer? Honestly, we would pass on a “free” upgrade to the OH. With the exception of a larger back closet (& tag axle), there isn’t any other difference that we can see between the OH and IH. Driving this beast around some of the campgrounds has been tight. I can’t even imagine driving a 45 ft rig around some of the state parks we prefer. I’d say we’re really happy with our IH size and would not want to go any longer. The double slides also makes a huge difference in interior space so the length isn’t as important to us. Thank you Kat. That is where our thoughts are at too, and the cons of a bigger rig would outweigh the pros. Kat, loved your closet modifications. Might add cedar to it too – the look and smell is amazing. 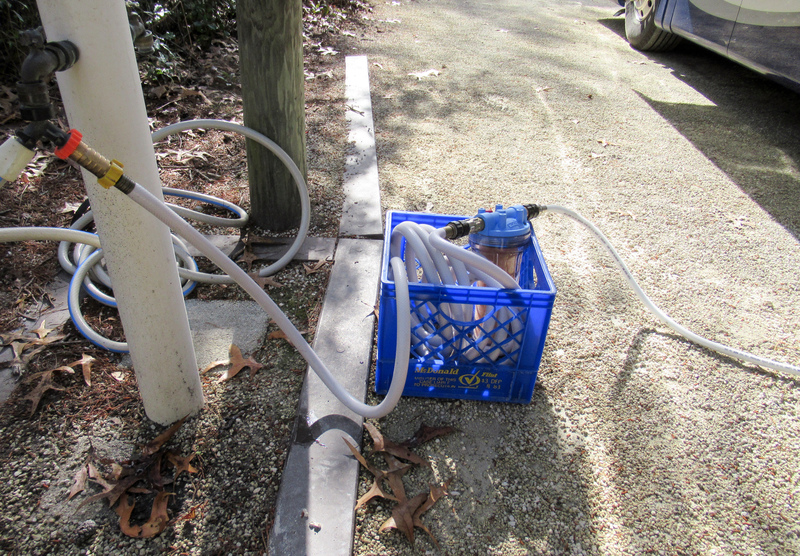 Hey, your second out side water filter will fit perfectly into an orange road side emergency cone! Cut off the top of the cone and slide the plastic water filter in from the top. They have big square bases so they dont tip over. It works great, might not cost a cent, and is easy to store! Thanks for the ideas! I like the cedar idea since our closet is closed all the time, I bet it would smell great! I love that cone idea except we ended up moving our carbon filter outside too! Hi Mike & Kat. I was in Red Bay the week before the eclipse watching our 40ih build and saw your tiffinrvnetwork posts (I go by DavidStHubbins on that forum). Looks like our coaches were built pretty close to the time. I am ready to upgrade to see level – Question – How did you get the “fixed” wet bay panel off to install the sensors? Really like the shorter wet bay panel! I need to do that. Will also be installing receptacle/plug for power protector. Passenger side would be much easier install, but would like it on the driver side for visibility in the power cord bay. Using selterm crimp connectors (sold on Amazon..like everything else…) to connect to power reel. Had to buy a special crimper also. How do you like your IH so far? For our See-Level install, we didn’t have to remove the wet bay panel at all since it was cut short at the factory. That means there was enough clearance that we could simply stick the sensors on the sides of the grey and black tank and the front of the water tank. We spliced lines for the wet bay light to get the power for the See-Level. Then we used a dremel to cut a hole into the wet bay panel to put in the See-Level tank monitor that came with the kit. I’m referring to the driver’s side wet bay area, not the passenger side side. If you want to install See-Level on the passenger side wet bay, you’ll need a really long skinny ratchet to get the screws out to remove that door. It can be done, it’s just a pain to do. Good luck! Would love to hear how it goes. I am considering mounting the sensors on driver side like u did. Originally thought you had put them on the passenger side for wire harness access. Do not like how far down the wet bay panel goes and thought it was that way for a reason other than aesthetics. I can barely fit the sewer hoses under the panel now and miss being able to see the fresh tank level like I could in the 36GH. Really like the 40ih. 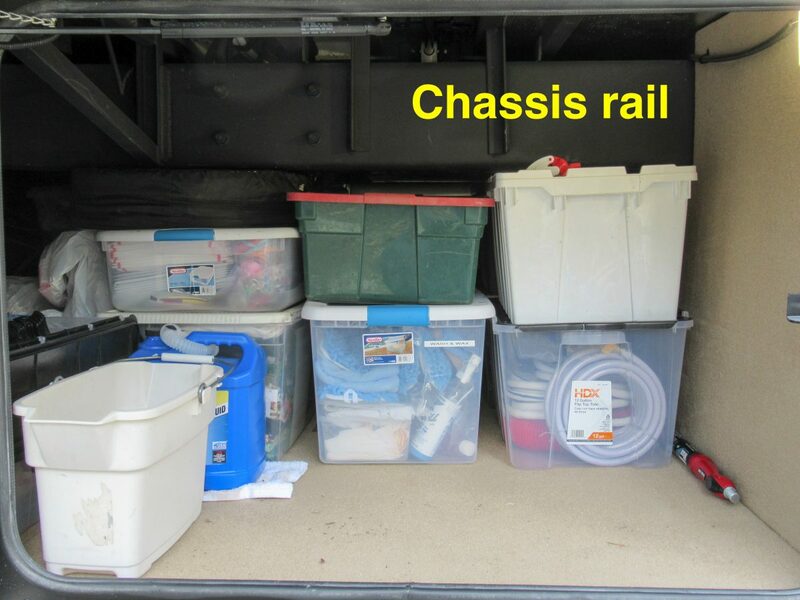 Can’t beat the storage, ride is top notch, and that rear bathroom…true 2 person usage! 40ih barely flinches in wind and truck passing…our 2014 36GH was decent, but not like this. Would like a little more engine power, but did not want to pay $12k. I think Cummins will do a programming upgrade up to 450HP for much less…will look into it soon. I am 6ft tall and have some issues with legroom and passenger mirror adjustment range because the driver area is moved quite a bit forward. The first mod was add swivel arm on shower rainhead to get it off of my head and a lower flow rainhead that works much better. Also have greater risk of no open spot available at rv park/campgrounds compared to 37ft 36GH coach. You have awesome paint colors…wish I would have visited paint before I had to leave Red Bay and maybe pick something better. We got the sunlit sand and it is kind of a dull color scheme. The steering hydraulics are very loud inside and a very dominant sound at low speed…wondering if anyone else has that issue. Maybe a line restriction or bad part at installation? I took some photos of our See Level install in case that helps. https://tinyurl.com/yd2xtglz We really think the wet bay panel is there just for cosmetic reasons. We were able to see behind it during the build, and there is no reason for the drop down part of the panel. You are right, cutting the panel, you should be able to fit the hoses for storage, plus see the fresh water level a lot easier. I agree that the IH has a lot of great improvements. We went from gasser so the drive is awesome! I do know Cummins will do the upgrade for a lot less, even cheaper if you’re willing to void the warranty. I like the idea of the swivel showerhead! We don’t use our rainhead at all but getting it further out would be great. We did notice some squealing/hissing noises while driving, especially at low speed. We asked the chassis folks and apparently it’s a flow regulator for the power steering. You can remove the regulator to fix the noise but then the steering would be very wobbly during low speeds. So we decided to leave it alone. On the 2018s, they have repositioned the water filter onto the wet bay panel, and use the lower area as a support for it. Also, the panel has a raised edge to it, for strength probably, which would make cutting it difficult. However, the panel is now in 2 pieces, with an inner panel that is removable after taking a couple of fittings off. This is what I plan to do when I install our seelevel.